Runoff from a farmer's field in central Ohio. SALEM, Ohio — The Kasich administration and the Ohio Environmental Protection Agency are poised to take a stronger regulatory approach to cleaning up the state’s waters, including the open waters of Lake Erie. Three weeks after declaring the western portion of Lake Erie impaired, the Ohio EPA, on April 16, released a study showing “no clear trend” of a nutrient loading decrease in most of the state’s watersheds, citing agriculture and other nonpoint sources as the main contributor. The study, known as the Nutrient Mass Balance Study, also found that the state is far from reaching its target of a 40 percent reduction in phosphorus loading into lake Erie, set in a 2012 agreement between the U.S. and Canada. Up until now, the state has been focused on voluntary efforts by farmers and private landowners, as well as new regulations that require farmers to be certified to apply fertilizer, and to avoid applying to frozen and snow-covered ground. But more regulations could be coming, as state leaders say they need more evidence. Butler said the state has spent more than $6 billion of its own money statewide, including $3 billion on the Lake Erie watershed to improve water quality since 2011. Butler said the impairment designation had been considered for years, but the state lacked a way of determining such an impairment. The administration sought advice from the U.S. EPA, Ohio State University’s Stone Lab, Bowling Green State University, The University of Toledo and the National Oceanic and Atmospheric Administration. Although the nutrient study cites a lack of progress, it also acknowledges that some results could take 10 or more years to be achieved. “While it is too early to detect statistically sound trends, the results of this study show no clear decrease in loading yet, especially in nonpoint source dominated watersheds like the Maumee, where the loading in 2017 was the highest of the years reported,” the study says, in text that is underlined. Libby Dayton, a research scientist with Ohio State University who is helping to rewrite the state’s phosphorus index, said the results of the EPA study are not surprising. However, she said it’s important to remember that the work is ongoing, and that like the study notes, some efforts take years. “It’s (Lake Erie) a big ship to turn, just because of the scale,” she said. 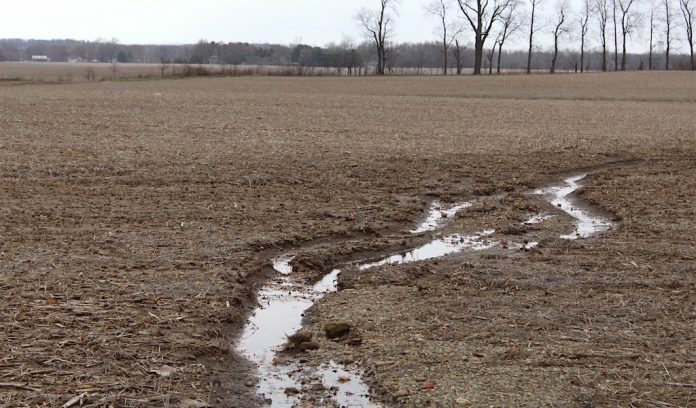 Dayton said the new phosphorus index will released this summer, and with it farmers will be given an online tool to allow them to estimate their long-term erosion and dissolved phosphorus losses. So far, her work shows that erosion is one of the biggest culprits, and making sure that nutrients are applied according to agronomic rates, or no more than what a crop needs for growth. “I’m very optimistic that voluntary changes in farming practices can result in achieving the 40 percent reduction,” she said. Farmers continue to adopt new farming practices and conservation measures, and some wonder if enough time has been given to know whether they work. Since the summer of 2015, farmers in the western basin have been required to meet new regulations for applying manure, and since September 30, 2017, all farmers who apply fertilizer to more than 50 acres must be state certified. Farmers helped form both regulations, but are concerned about what lies ahead. Joe Cornely, communications director for Ohio Farm Bureau Federation, said it’s important that state regulators not get ahead of the science. He said a lot is still being determined, like how and why nutrients move. “Basing decisions on admittedly inadequate amounts of data is a problem,” he said. Cornely said the state’s approach so far has recognized that improvement takes time, and that more information is needed. In recent years, the Farm Bureau has partnered with state and federal leaders to research new farming practices through the use of demonstration farms and edge-of-field testing — hoping to find solutions that work for farmers and the nonfarm public. Even with the impairment designation, Butler said he doesn’t believe the state will be required to form new Total Daily Maximum Load limits for nutrients, because similar nutrient tracking has already been done. Butler is hopeful that a bill will soon be introduced into the state legislature that will lay out the framework for what is expected of agriculture. The bill would include lower phosphorus discharge levels and would also expand the definition of agriculture pollution to include fertilizer. This would allow the EPA to declare parts of watersheds in distress, and focus on specific areas. Butler said the bill has not been popular with farmers and so far a sponsor has not been found. I am going to get a lot of flak for my view but no-till vertical-till which is suppose to be solving problems are adding to the problem. Erosion and fertaliser runoff have incrested as this practices have become put more into play. Without the use of cover crops, water is accelerated across open ground if nothing is there to stop it. I would never suggest going back to mow board plowing but you need to do some sort of work to keep your soil healthy cover crops or tillage to maintain your soil. http://www.farmbiult.net and see my answer for sustainable farming.